2018 couldn't have been better for LORD OF THE LOST: Big headliner tour, impressive festival shows and the release of their sixth studio album Thornstar, which debuted #6 of the German album charts. 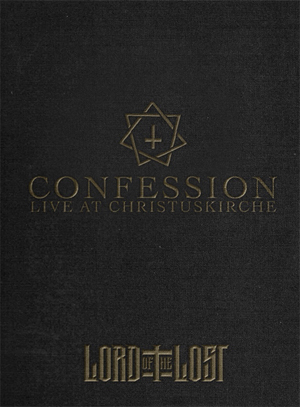 To finish the year properly the band has a special Christmas gift from November 16th: Confession (Live at Christuskirche). There LORD OF THE LOST celebrates their unpredictable variety once again and present old songs in a new classic guise - including a live ensemble and an impressive location. Recorded in the Christuskirche Bochum during their "Swan Songs Tour 2017", stunningly arranged dark rock symphonies can be found between dramatic chamber orchestra arrangements with gentle strings and piano. The well known hard sound yields to leave some room for intense goosebumps. Available as limited DVD + 2-CD DVD Pack, Deluxe Box and Digital Audio Album. "Waiting For You To Die"
"Full Metal Bawl (The True Story About Her Death)"
"Fists Up In The Air"